Now, stop for a moment. When you think about answering that question, do you feel 1) excited and eager to share, or 2) bewildered, searching to remember, or 3) clenched, thinking, “Enough with the learning already!” ? Learning has taken a bad rap. I think this is because we think of “Learning” as something we have to do for a set period of time, as in the school years, during a university degree, or a formal class. The most highly valued evidence that this type of learning has been successful is performance on a standardized test. Somehow our culture sets us up to expect that one day we’ll be done learning, and then will go do something real, or practical. Learning has been taken over by professionals whose emphasis is on teaching, or content delivery. Teaching in our schools, and the vast majority of inservice or corporate training programs are woefully one-sided and delivery-oriented. All too few are concerned whether the “target” (student) actually received, assimilated, and is using — learned — the content. I’ve been intrigued with this distinction between teaching and learning since I first read Carl Rogers‘ Freedom to Learn in the early 1970’s. But I digress. . .
Rogers says, in part, that nobody can teach another person anything. All they can do is create the conditions so that the individual can learn for themselves. Think of the “force feeding” you may have experienced with your worst “educational experience.” Contrast that with the joy, sense of accomplishment, vitality, and total absorption you have felt when you are truly engaged with something new that interests you. This is learning, true learning, and it can go on throughout your life. The evidence that this kind of learning has occurred is that behavior changes. You are doing something new, or doing something old in a new way. 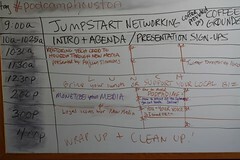 This past weekend, I attended an event called PodCampHouston. Based on the BarCamp model, PodCampHouston attracted people who were interested in learning more about online media, or “new media;” specifically podcasts and video blogging. This was my second experience with the Camp idea, and it’s unlike any workshop or conference I’ve ever experienced. In fact, it is promoted as an “un-conference,” or more accurately, a “user-generated” conference. Each participant is encouraged to make a presentation! A white-board in the entry hall is marked with a grid, times on one axis and room availability on the other. You sign up for a time, announce your topic, and then people “vote with their feet” when the time comes. Well, I took the plunge and signed up to present. Several people had expressed interest in my vocal coaching and movement work, so I thought I could probably riff for awhile on “You and Your Voice” for these budding broadcaster/podcasters. What a blast! Twenty-five people showed up, asked questions, and the room filled with animated conversation, connection, and laughter. Moshe Feldenkrais said that anything you learn that stays with you in a profound and positive way was learned when you were having fun. At PodCampHouston, we met as friends and colleagues in an atmosphere of fun and mutual respect. We learned from each other, shared, and grew in the process. I have two core beliefs that regularly pop up into consciousness. 1) You can do anything if you don’t know how, and 2) Anything worth doing is worth doing badly. Remember what I said about learning changing behavior? Well, Sunday afternoon, I sat down at my computer and made my first video podcast series! It’s called “You and Your Voice: Do I Sound OK?” and is taken from my presentation at PodCamp Houston. As with any new ventures, it’s a first approximation. I don’t have a fancy set or makeup artist. The six, 10-minute segments are basically just my talking head. However, I created some content, shared it, and I’ll get better as I continue to learn more. Yes, it’s a little scary to put myself out there. Yes, there will be criticism at all levels. Oh well. It was fun. I learned something. I’ll do it again. So there. Madeleine L’Engle wrote a book called “Walking On Water” about the creative process. She uses the metaphor of a vast and beautiful lake to represent the sum of all creative work — every symphony, novel, play, invention, everything. She says you can’t hold yourself to the standard of creating a St. Matthew Passion each time you begin your creative work. Your only job is to “feed the lake.” Contribute something, even a trickle, from your small stream of creativity, no matter what it is. Accept, and feel satisfied, with that. You and your abilities will improve over time as you continue to “feed the lake.” I love this image. The Feldenkrais Method is a great way to jump-start your love of learning (real learning) and your creativity. It uses your own body, your attention, and gentle movement as the vehicle for developing awareness, fluidity in thought and action, and a sense of infectious curiosity. If this old dog can learn new tricks, so can you! ← What’s In Your Junk Drawer? I enjoyed your write up of your contribution to Podcamp Houston! I'm glad I get the chance to see your video podcast since I couldn't attend your session in person. I am very excited by what is happening with new media in Houston!